Home > The Barbary macaque > Not pets. Not performers. Keep them in the wild. One of the most important actions BMAC takes to protect the Barbary macaques is campaigning against the trade in macaques as pets and performers. Here, we break down the reasons why this work is so important. How many are you familiar with? You can really help us by sharing some of these points with your friends – it only takes a minute to spread knowledge that could ultimately save a species. Wild versus domesticated: what’s the difference? At a glance, it might seem that keeping a Barbary macaque as a pet is the same as keeping a dog. The reality is very different. Dogs have been bred by humans for thousands of years, and the breeds we recognise today have adapted with us to be the safe, happy companions we want as pets. Research has even shown that dogs can understand human facial expressions due to their long and complex association with us. Barbary macaques, on the other hand, have never been domesticated; unlike dogs, they have never been selectively bred for characteristics that make them good pets. They cannot adapt to life in a human environment, and are unable to adjust psychologically to having humans as companions instead of other Barbary macaques. This means that no matter how good a person’s knowledge of wild Barbary macaques is, they would never be able to keep them happy as pets. The only way they can be kept well in captivity is in zoo exhibits or sanctuary settings where they can interact with a large group of other Barbary macaques and have as natural a habitat as possible. The trade in Barbary macaques is illegal, and keeping primates as pets is also completely banned in 11 EU states, as well as Morocco and Algeria. Many other countries in the EU also have legislation against the trade in Barbary macaques and other primates, so anyone keeping or importing one without a licence is breaking the law. Punishments vary from country to country, but in Morocco, the selling or keeping of a Barbary macaque is punishable by a fine starting at €2000. 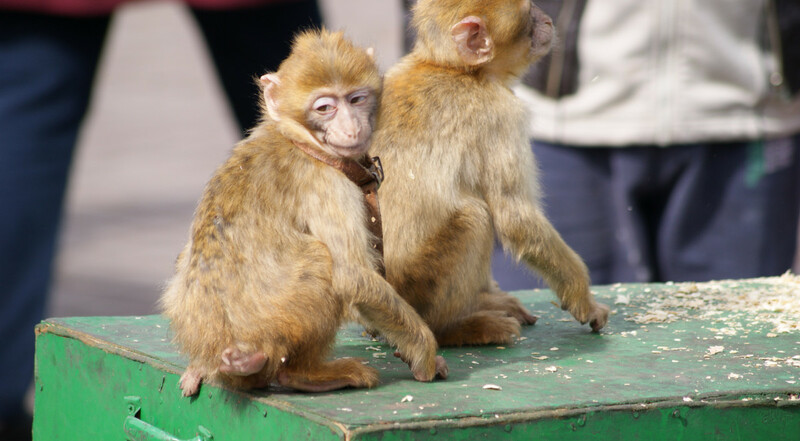 Barbary macaques kept as pets or performers suffer from physical and psychological problems. It is difficult to provide them with a diet that matches the foods they forage for in the wild, so they can develop difficulties due to poor nutrition. If they are kept in small, cramped cages or boxes, they suffer musculoskeletal problems which can be irreversible even if they are later confiscated and moved to a more appropriate enclosure. The psychological trauma of being kept with humans instead of other macaques and the boredom and stress of living in the human world cause Barbary macaques to develop behavioural issues such as repetitive movements, self-mutilation and extreme aggression. The latter often results in retaliation from people, worsening the cycle of mistreatment and aggressive behaviour. Barbary macaques who reach adulthood in these conditions are very rarely able to be rehabilitated into a group of macaques due to their inability to associate with other monkeys. They are certainly unable to be released into the wild, so there is no happy ending for many macaques confiscated from the pet trade. Small, endearing baby macaques grow quickly into large adults with big teeth, and being bitten by them does a lot of damage, especially if the wound becomes infected. Keeping a macaque as a pet also puts you at risk of contracting the diseases they carry – not least rabies, which is very often fatal. It might seem that buying one baby macaque to keep as a pet couldn’t possibly impact a whole species, but this is only the surface of the problem. It is highly unlikely that the group your pet came from lost only one baby; even if no others were taken for the pet trade, there are many other factors that affect infant survival, and the decreasing wild population needs as many as possible to reach adulthood if there is any hope of this Endangered species remaining safe in the wild. You might also think that you are one of the only people who might like a pet macaque, and that you keeping one to the best of your ability has minimal impact on the species as a whole. However, even if you ignore the welfare implications for the macaque you keep, your impact is still far-reaching. Think of the way pictures and videos spread on social media – those cute pictures of your pet will very quickly make many other people want to own one too. The same applies to posing with performing macaques when you visit Marrakech, or sharing films and online videos featuring macaque ‘actors’. DO visit responsible zoos and wildlife parks if you want to see Barbary macaques close up. You will learn far more about their fascinating personalities this way than you would if you kept one at home, where it would become depressed and withdrawn. DO contact us and other wildlife NGOs if you travel to Morocco, Algeria or Gibraltar to find out the most ethical way of viewing macaques in the wild. DO look out for volunteering opportunities with us and other NGOs who are working to halt the illegal pet trade and protect Barbary macaques in the wild. Every little helps, and we appreciate every minute of our volunteers’ time. DO contact us (anonymously, if you wish) if you see Barbary macaques for sale, or being used as performers, when you are in Morocco. DO share our website and those of our conservation partners with your friends, family and colleagues to help us spread the message that Barbary macaques are not pets. DON’T buy a Barbary macaque to ‘rescue’ it. This only fuels the trade, as the seller will use your money to afford the poaching of several more infants from the forest. As mentioned above, contact us if you suspect that a captive Barbary macaque needs help. DO report the macaque’s presence to us, giving us as much information as possible – the name and address of the shop, a phone number, and a photo of the location are helpful. DON’T post the photo or location on any Facebook group/page or other social media. We know that people involved in the illegal Barbary macaque trade infiltrate groups like ours to find out such information, which is why we never publish any reports until we know the result. The traders get advance notice from social media posts and can avoid having their animals confiscated simply by removing them from view for a few weeks. DON’T have your photo taken with performing macaques. These photos make keeping macaques seem okay, and when shared on social media, they reach thousands of people very quickly. DON’T support the normalisation of the illegal trade by liking, sharing or re-tweeting images and videos of pet or performing macaques on social media. Instead, direct your friends to images of macaques in the wild, and resources about their amazing natural behaviour. DO take part in our campaigns!